SpaceX's Falcon 9 rocket lifts off from space launch complex 39A at Kennedy Space Center, Florida on March 30, 2017, with an SES communications satellite. 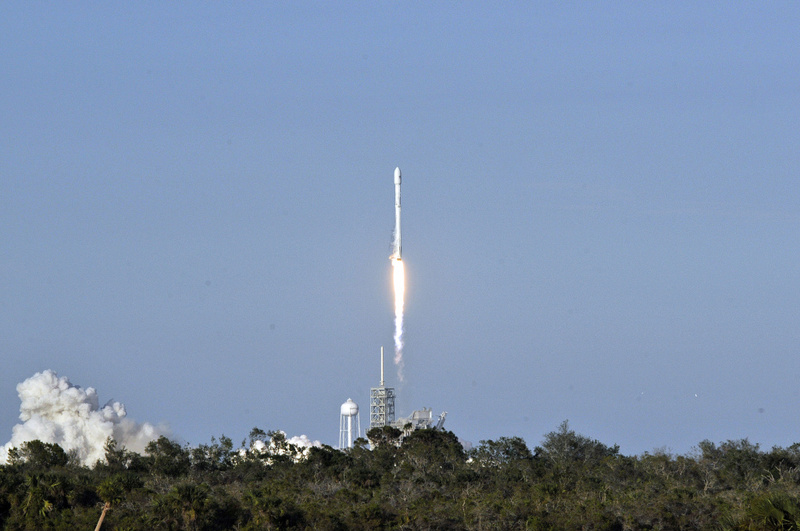 SpaceX blasted off a recycled rocket for the first time on, using a booster that had previously flown cargo to the astronauts living at the International Space Station. Elon Musk and his company SpaceX were in the news last week. They won a multimillion-dollar contract with the U.S. Air Force to launch satellites, but that success has been a long time coming. SpaceX and other privately operated space companies, such as Blue Origin run by Amazon's Jeff Bezos, have had plenty of ups and downs. 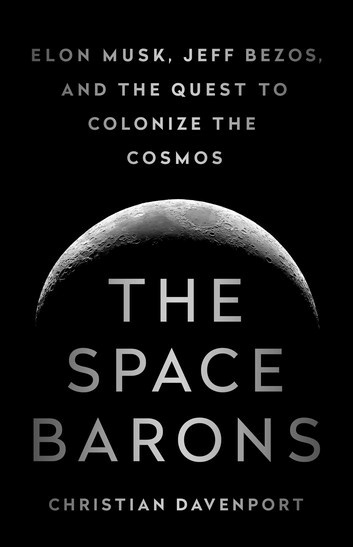 It's all chronicled in Christian Davenport's new book, The Space Barons: Elon Musk, Jeff Bezos and the Quest to Colonize the Cosmos, out March 20. Take Two spoke to Davenport about the backstory behind these companies. What makes companies like SpaceX and Blue Origin different from their predecessors in the space industry? SpaceX and Blue Origin look at the space industry and ask why we haven't achieved more, Davenport said. they want to see more missions to more remote destinations. They [SpaceX, Blue Origin, etc.] decided if NASA's not going to be able to do it, maybe we should. I don't think they're blaming NASA. NASA gets its funding from Congress and during the Apollo era it got like 4% of the entire national budget. And since then it got cut and cut and cut. Now these billionaires, who in some cases have the wealth of entire nations, are saying we're going to put our own money into this. We're going to drive harder, we're going to find efficiencies and we're going to take over. These companies are also less risk adverse than the National Aeronautics and Space Administration (NASA), Davenport said, which is partially due to the fact that NASA has had crashes that cost astronauts their lives. SpaceX hasn't flown people into space, but that will soon change because they have a contract to fly astronauts to the International Space Station. SpaceX may have been successful thus far, Davenport said, but flying a human being is a unique challenge. How are these companies getting people excited about space? Back in the 1960s and 1970s, during the Apollo program, the public was excited about space exploration, Davenport said. That enthusiasm dipped, but advances like SpaceX's digitally broadcast launches are bringing it back, he said. They've adapted their companies for the Internet age, where you've got people on the beaches in Florida to watch these launches, but now you've got all these people tuning in to watch these live broadcasts on the internet. Advancing space exploration isn't just about adventure for Musk and Bezos, Davenport said. they want to reinvigorate young people's interest in space and pursuing careers like engineering. Was there ever a point when SpaceX thought it might not be able to continue? With one of their first rockets, SpaceX had three unsuccessful launches in a row, Davenport said. As the fourth launch approached, the company wasn't sure it would be able to continue if the next launch was unsuccessful. Elon had invested $100 million of his own money and they were coming up on the fourth flight and said if this doesn't work he was out of money, that was going to be it. They were able to pull it off, the very last flight. They made it; they made it to orbit. Davenport said SpaceX has plenty of critics. But overall, the success the company has been able to achieve is beyond what most people expected. How has the competition between SpaceX and Blue Origin impacted the two companies? The competition is a key part of pushing advancement in space exploration, Davenport said. Back during the Cold War, competition with the Soviet Union pushed the U.S. to achieve accomplishments like getting a man on the moon. Now competition between companies like SpaceX and Blue Origin is creating a new kind of space race, which is something these companies see as a positive motivator. Elon told me when I talked to him for the book, he said, 'If I had a button and I could make Blue Origin, that's Jeff Bezos's company. If I could press that button and make them go away I wouldn't.' He knows he needs to be pushed, he needs a rival, he needs competition to make sure his costs are in line and he's continuing to push and push. What's next from these companies? Putting people in space is the next step, Davenport said. Different companies have different schedules and goals, but human space travel is the next step and it could happen this year. The end goal of these companies, which makes them different from NASA, is making space accessible to average people, not just trained astronauts. Blue Origin is planning suborbital trips to the edge of space, which would take space tourists up about 62 miles into the sky. Blue Origin actually had a job posting the other day for, essentially, a space flight concierge -- someone to do sales and then prep folks. They are already advertising how big their windows are. They'd be the biggest windows that would ever fly into space and you'd see the curvature of the earth and you'd see the thin line of the atmosphere.